Just five years after the Deschutes NF was approached with the idea of preserving the rundown Elk Lake Guard Station, restoration of the 1929 log cabin is substantially complete and up and running as a visitor information center and interpreted historic site along the scenic Cascade Lakes National Scenic Byway. As the idea of restoring historic Elk Lake Guard Station caught on, Bend–Fort Rock Ranger District archaeological technician Chris Lipscomb began to plan the effort and the first of three PIT projects that, along with other FS projects, have restored the cabin and rehabilitated its grounds. The fourth PIT project, in 2002, completed the work, and the site saw its first full summer of use that year. Nine PIT volunteers from the three Pacific Coast states and Arkansas came to work on the September 21 to October 3, 1998, project, some for one week and some for two weeks. 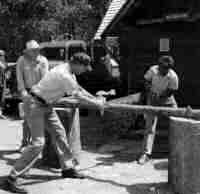 Led by the late John Lupher, a Deschutes NF employee whose log construction and historic structure restoration experience were critical, the PIT crew replaced the cabin’s rock foundation and rotted sill logs, sealed its logs with preservative and replaced damaged chinking, and got a good start on rebuilding its porches. Spruce logs, rocks, and other materials for the project had been selected and hauled to the site earlier that summer. During a second PIT project the week of July 19 through July 25, 1999, six PIT volunteers led by Chris and contract historic restoration specialist Pete Cecil accomplished several big jobs. By the time the week was over, the cabin’s front porch had been rebuilt; its windows and doors had been removed, repaired, repainted, and replaced; a good start had been made on rebuilding the back porch; and a variety of other small jobs had been accomplished. Veteran PIT volunteer Gordon Pfister arrived on the job with a new, old-time, shield-shaped entry sign to hang on the newly restored Elk Lake Guard Station. Restoration work during the summer of 2000, accomplished off and on through the summer by FS employees and PIT volunteers, produced great results. The back porch of the cabin was rebuilt and the roof replaced. The interior walls were cleaned with an acid solution and the exterior walls treated with another coat of preservative stain. Outside, barrier posts were installed, a rock walk to the flagpole site was built, a flagpole was built for installation the next summer, and the log structure from which the entry sign hangs was erected and stained. Also, hazard trees were cut and removed, and ground cover was planted. As this work progressed, volunteer information specialists Ted and Adele Pelletier from the Bend–Fort Rock Ranger District’s interpretive services team staffed the station four days each week for a total of 38 days, during which they served 687 visitors. Ten PIT volunteers and two FS retirees realized this potential during the summer of 2002. During 56 operating days adding up to 568 hours, these trained and uniformed volunteers from the three Pacific Coast states and Montana provided consistently outstanding service. The numbers? 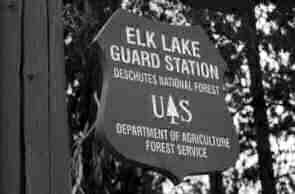 They welcomed and provided information to 1,233 visitors to the Deschutes NF through a program where they interpreted Historic Elk Lake Guard Station and the job of the old-time FS guard. In the early days of the NF System, the forest guards who were sometimes posted at guard stations were the forest rangers’ right-hand men in the field. Guard stations were satellites of ranger stations. When, in 1920, a wagon road connected Bend and Elk Lake, recreation boomed in the area. NF campgrounds were built, summer home sites were leased, and Elk Lake Lodge was opened. By 1924 there was an Elk Lake post office. The forest ranger in Bend soon needed a forest guard in the area to serve visitors, maintain facilities, and protect resources. This forest guard needed a base, and in 1929 the Elk Lake Guard Station log cabin was built. At first, because funds were scarce during the Great Depression, this station was not staffed. From the later 1930s through the 1990s, however, forest guards and other Forest Service employees and volunteers served the public from this small station. Their job grew as the population grew, access improved, leisure time increased, and more forest visitors came. In 1997, the Forest Service decided to retain this old guard station—along the popular Cascade Lakes National Scenic Byway—as a visitor information center and historic site. During the next few years, Forest Service employees and volunteers restored the cabin and rehabilitated its grounds. 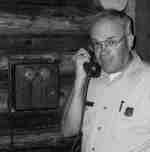 Now, as you visit Historic Elk Lake Guard Station, you get a feel for how the forest guard lived and worked during the middle decades of the 20th century—in a very different time not too long ago. The impact of this project is reflected in comments visitors leave in the station’s guest register. Very informative volunteers! Thanks for the directions! Beautiful preservation job! Good to see an old treasure renewed! Very rangery! How do I become a guard? The Historic Elk Lake Guard Station will continue to represent our FS heritage and help implement the FS mission of “caring for the land and serving people” as long as there are PIT volunteers to staff it.